Professor Toni DiTommaso is working on a nation-wide research project assessing the distribution and genetic diversity of the invasive perennial weed, Johnsongrass (Sorghum halepense). Currently, NY State is at the geographic northern-most limit of its range, but it is expected to increase in abundance in the state over the coming decades. He has included a brief description and several images of this species below to help with identification in case you are not familiar with it. 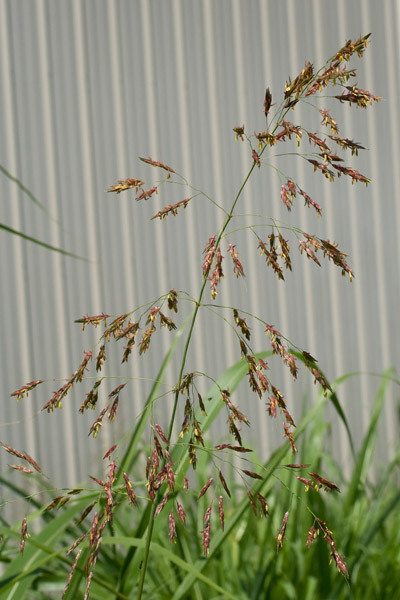 He is reaching out to you to help him locate Johnsongrass populations in NY State as he would like to collect seeds from these plants later this month and into early fall. These seeds along with seeds collected in other regions of the country will be grown in “common gardens” at locations across the country including here in central NY. This research will give us a good idea of how well adapted different populations of this invasive species are to growing in various regions of the country and in which regions it may become especially troublesome to manage. If you know of Johnsongrass populations in NY State that have not yet been killed by herbicides or mowed (he needs to collect seeds), please e-mail Toni (ad97@cornell.edu) the precise location of the population (GPS coordinates, road intersections, etc. ), the type of habitat it is found in (e.g. corn field, roadside, back of barn), and the approximate size of the population(s) (e.g. 10 ft x 15 ft). If you would like to take a few pictures of the plants and e-mail them to Toni, he could try to confirm that it is indeed Johnsongrass. When this research is completed in a few years, he hopes to present his findings at various agricultural extension venues in the State. Thank you for your help and he looks forward to hearing from you. BRIEF DESCRIPTION: Johnsongrass is a tall, coarse, grass with stout rhizomes. It grows in dense clumps or nearly solid stands and can reach 8 feet (2.4 meters) in height. Leaves are smooth, 6-20 inches (15.2-50.8 cm) long, and have a white midvein. Stems are pink to rusty red near the base. Panicles are large, loosely branched, purplish, and hairy. Spikelets occur in pairs or threes and each has a conspicuous awn. Seeds are reddish-brown and nearly 1/8 inch (0.3 cm) long. The ligules on Johnsongrass leaves (A) are membranous, while the ligules on Fall Panicum leaves (B) are a fringe of hairs. Barnyardgrass (C) lacks ligules. Get the full issue or subscribe by email to receive notifications of new reports including Videos from the Field. Follow NYS IPM Field Crops on Twitter! The Weed Science Society of America (WSSA) announced the agenda for a national scientific summit on herbicide resistant weeds, scheduled for 9 a.m. to 5 p.m. September 10 in Washington, D.C. WSSA plans to offer the event as a live webcast for those unable to attend in person. Those wishing to participate via webcast will find a link posted on September 10 at http://wssa.net/2014/08/resistance-summit-ii. herbicide resistance and accountability for that role. management decision makers and advisors. management programs for specific threats; e.g. Palmer amaranth in Iowa. • Implement programs for scouting and controlling weed escapes. implementing field-by-field herbicide resistance management plans. • Incentivize innovation in non-chemical weed management practices. We’ve discussed pasture grasses, legumes, pasture weeds and management ideas for pasture improvement on these pages many times before. All good topics. When you call to mind pasture weeds though, I’d bet you picture milkweed, goldenrod, a couple different types of thistles and maybe bedstraw. These are pesky and important weeds in many pastures, but there are other, sneakier weeds that may escape your attention. These sly and mischievous weeds require closer inspection and a bit more scrutiny to figure out. Ideally, pastures are dense, perennial sods consisting of mixtures of high-yielding, palatable grasses and legumes. In reality, most pastures do not quite match this perfect ideal. Weeds are normally present in some number, ranging from insignificant to seriously problematic, depending on management and history. 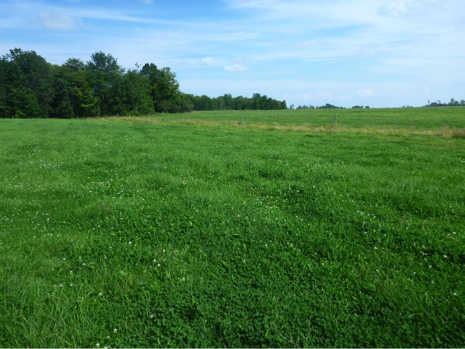 Weed density within a pasture can change over time, and can vary from one area to another within a pasture. You may notice, in your own pastures or hay fields, that weeds are often not distributed uniformly, but rather that some plant species are concentrated on knolls, along the woods, in wet spots, or in high traffic areas. Let’s turn our attention to some particularly sneaky weeds that are often, but not always, found in lower, wetter areas of the pasture – the sedges and rushes. I’m referring to them as ‘sneaky’ because they’re a bit harder to spot in the pasture. They look a lot like grasses to an amateur observer, but that is about as far as the similarities extend. 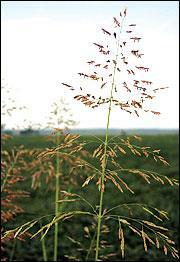 As a group, grasses consist of a jointed stem with a few tillers, long and slender leaves with parallel veins. They range in height from turf to giant bamboo. Grasses may be annual or perennial but all have their growing points near the soil surface, so they can survive repeated mowing or grazing. Grasses reproduce via seed or underground structures. Most of the hay and pasture grass species (bluegrass, orchardgrass, timothy, fescues, reed canarygrass, etc.) are quite palatable and produce moderate to high yields. Sedge and rush species also have long slender leaves but occupy completely different branches on the evolutionary tree of life than grasses. Sedges and rushes are perennials that livestock typically avoid, finding them unpalatable. There are well over 1000 different sedge species, but the most common sedge found in Northeast pastures and hayfields is Yellow Nutsedge. Yellow nutsedge is noticeable for its pale green color, spiky flowers and underground tubers, but its most distinctive feature is its stem. If you compare the lower stems of sedges and grasses, you’ll discover that sedges typically have triangular stems without nodes while grasses have round or flattened stems with nodes. This key difference is the reason for the memorable phrase “sedges have edges, but grasses have knees.” Sedges reproduce by underground tubers and rhizomes. Rushes are short plants that resemble grasses and sedges and are also found in lower, wetter areas of a pasture or hayfield, although rushes may grow in drier or compacted areas too. The unique feature of rushes is their 3-petal, lily-like flowers. In fact, botanists refer to rushes as “lilies turned to grass” to help them remember their distinctive flowers. Rushes reproduce by vegetative rhizomes or by seed. The tough, wiry, round stems of rushes are also avoided by livestock who generally do not find them palatable. In the Northeast, the most common of the rushes is Slender Rush. Nutsedge and rushes might be most noticeable as animals are finished with a pasture or paddock. The livestock will have eaten grasses and other appealing plants, leaving behind patches of Yellow Nutsedge and Slender Rush. It is disappointing to see large, uneaten areas of low-yielding, unpalatable pasture, but biological features of rush and sedge make them difficult to control. Their underground reproductive structures make mowing or clipping ineffective as a means for removal, but this strategy can slow their spread, if it is timed before flowering. Herbicide options for these two weeds are limited, but Permit and Yukon have recently had hay and pasture applications added to their labels. They may be used on yellow nutsedge in grass pastures with no grazing restriction for lactating or non-lactating animals. If the field is not too wet for machinery, suitable grasses or legumes can be overseeded with a no-till drill or, as a more drastic measure, the sod may be killed and soil can be tilled for replanting of appropriate grasses and legumes. Often though, the sedges and rushes occupy areas that may be difficult to access with tractor equipment. In this case, the field could be tiled for better drainage if that option is economically advantageous. Legume species such as red or white clover can be frost-seeded in the spring to try and introduce more desirable species, but the rush and sedge species will likely persist. 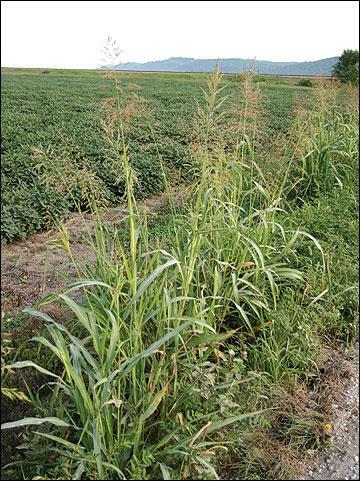 Sedge and rush weeds take a keen eye to notice, but their impact can be just as important as thistles or milkweed or goldenrod in a pasture or hayfield. Their presence reduces overall productivity of the field and presents a challenge to the farm manager. Uva, Neal and DiTomaso, Weeds of the Northeast, Ithaca, NY: Cornell University Press, 1997. Kersbergen, R. 2004. Bulletin #2491, This Old Hayfield: A Fact Sheet on Hayfield Renovation. U Maine Extension. Specification Guide Sheet For Pasture and Hay Planting (512), Vermont NRCS http://www.nrcs.usda.gov/Internet/FSE_DOCUMENTS/nrcs144p2_016364.pdf. For more information about field crop and soil management, contact your local Cornell Cooperative Extension office or Kitty O’Neil, Regional Field Crops and Soils Specialist, Cornell University Cooperative Extension, 315-379- 9192 x253; kao32@cornell.edu. The Departments of Crop and Soil Sciences and Horticulture along with the Cornell University Agricultural Experiment Station and the Cornell Cooperative Extension will be hosting the annual New York Weed Science Field Day at the H.C. Thompson and Robert B. Musgrave Research Farms. As always, NYSABA will be hosting a BBQ lunch at Musgrave Farm prior to the Field Crop session. Pre-registering for the BBQ prior to July 10th saves $3! Please see the pre-registration forms for contact information with any questions. CCA and DEC Credits have been requested for field crop and vegetable crop field days. Pre-registration for the Vegetable Crop Weed Control session is preferred. Download the WEED DAY 2014 Registration Form. Pre-registration for the Field Crop Weed Control session is not required. Get the full issue or subscribe to the online version to receive notifications of new reports including Videos from the Field throughout the summer. Little Black Slugs on Small Grains? Cereal Leaf Beetle? 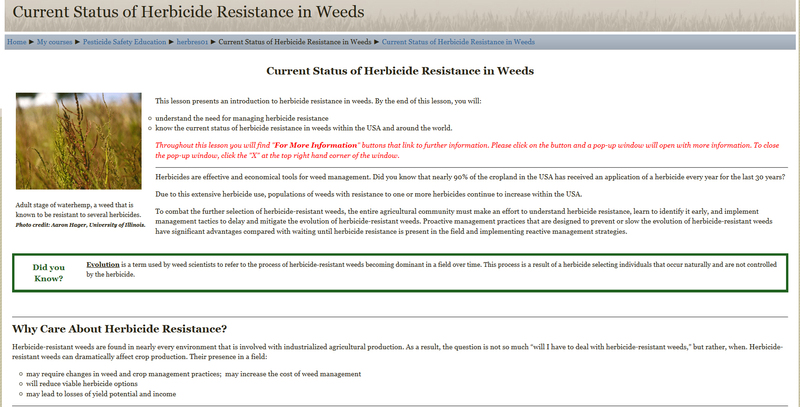 Comments Off on New Pesticide Applicator Recertification Credit Online Modules on Herbicide Resistance Now Available! New Pesticide Applicator Recertification Credit Online Modules on Herbicide Resistance Now Available! Current Status of Herbicide Resistance in Weeds (above image) is one of five new online modules on herbicide resistance available through the PMEP Distance Learning Center. Five new courses on herbicide resistance are now available online through the PMEP Distance Learning Center. Each course qualifies for New York pesticide applicator recertification credits. There is a small fee to take each course. 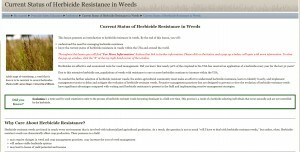 The online courses include: 1) Current Status of Herbicide Resistance in Weeds (0.5 credits), 2) How Herbicides Work (1.0 credits), 3) What is Herbicide Resistance(1.0 credits), 3) Scouting After a Herbicide Application(1.0 credits), 4) Confirming Herbicide Resistance (1.0 credits) and 5) Principles of Managing Herbicide Resistance(1.0 credits). The online courses were developed by Mary McKellar and Russ Hahn in cooperation with Ron Gardner from lesson modules (Herbicide Resistant Weeds) originally created by the Weed Science Society of America. The development of the online courses was supported through funding from the NYS IPM Program.